I mean, isn't it great that high school students in some inner city area will greet me as I walk in, as though I were a pop star. That is so amazing. Because all that they've got out of what I've done is a message of hope. And the fact that our main message is "You make a difference every day. You matter. Your life is important." Dr. Goodall now travels the world raising awareness about the dire situation facing the natural world  and many of its species. Her mission includes programs for communities in Africa to protect forests, create sustainable livelihoods and support health and education. The Jane Goodall Institute runs a global program to create a new generation of conservationists called Roots & Shoots. >More about Roots & Shoots. Jane Goodall found a heroic conservation story far from the Tanzanian forests  the plains of Nebraska. There she participated in George Archibald's crane migration program. Archibald, founder of the International Crane Foundation, is credited with raising the population of 66 Whooping Cranes left in the wild to more than 350. His techniques include rearing cranes in human care, having human handlers wear crane costumes to avoid human imprinting and using ultra-light aircraft to lead cranes on migration flights. You can find out more from Operation Migration's journeys here. >More about the battle to save endangered and threatened species. >More about Jane Goodall's heroes. Jane Goodall began her landmark study of chimpanzees in Tanzania in June 1960, under the mentorship of anthropologist and paleontologist Dr. Louis Leakey. Her work at what was then called the Gombe Stream Chimpanzee Reserve would become the foundation of primatological research and redefine the relationship between humans and animals. One of Jane's most significant discoveries came in her first year at Gombe, when she saw chimps stripping leaves off stems to make the stems useful for fishing termites out of nearby mounds. This and subsequent observations of Gombe chimps making and using tools would force science to rethink the definition that separated man from other animals: "man the toolmaker." Jane also observed chimps hunting and eating bushpigs and other animals, disproving the widely held belief that chimpanzees were primarily vegetarians. Dr. Goodall defied scientific convention by giving the chimpanzees names instead of numbers and insisted on the validity of her observations that the chimps had distinct personalities, minds and emotions. She wrote of lasting chimpanzee family bonds. Through the years her work yielded surprising insights such as the discovery that chimps engage in a primitive kind of warfare. Dr. Goodall established the Gombe Stream Research Center in 1965. Under the stewardship of Tanzanian field staff and other researchers, it continues Dr. Goodall's work today, making it one of the longest uninterrupted wildlife studies in existence. In 1977, Goodall established the Jane Goodall Institute (JGI), which supports the Gombe work and other research, education and conservation and development programs. These include community-centered conservation efforts in Africa which provide local people with tools to build sustainable livelihoods while promoting regional conservation goals such as reforestation and an end to the illegal commercial bushmeat trade. JGI's Roots & Shoots program, which supports students from preschool through university in projects that benefit people, animals and the environment, today hosts about 8,000 groups in 96 countries. Dr. Goodall travels an average 300 days per year, speaking about the threats facing chimpanzees, other environmental crises, and her reasons for hope that humankind will solve the problems it has imposed on the earth. She continually urges her audiences to recognize their personal responsibility and ability to effect change through consumer action, lifestyle change and activism. Dr. Goodall's scores of honors include the Medal of Tanzania, the National Geographic Society's Hubbard Medal, Japan's prestigious Kyoto Prize, the Prince of Asturias Award for Technical and Scientific Research 2003, the Benjamin Franklin Medal in Life Science, and the Gandhi/King Award for Nonviolence. In April 2002 UN Secretary-General Kofi Annan appointed Dr. Goodall to serve as a United Nations "Messenger of Peace." In 2004, Prince Charles invested Dr. Goodall as a Dame of the British Empire, the female equivalent of knighthood. In 2006, Dr. Goodall received the and the French Legion of Honor, presented by Prime Minister Dominique de Villepin, as well as the UNESCO Gold Medal. Dr. Goodall's list of publications is extensive, including two overviews of her work at Gombe - IN THE SHADOW OF MAN AND THROUGH A WINDOW - as well as two autobiographies in letters, the best-selling autobiography REASON FOR HOPE and many children's books. Her latest book is HOPE FOR ANIMALS AND THEIR WORLD: HOW ENDANGERED SPECIES ARE BEING RESCUED FROM THE BRINK. THE CHIMPANZEES OF GOMBE: PATTERNS OF BEHAVIOR is recognized as the definitive work on chimpanzees and is the culmination of Jane Goodall's scientific career. Dr. Goodall has been the subject of numerous television documentaries and the film, JANE GOODALL'S WILD CHIMPANZEES (2002). In 2004, she was featured in two Discovery Channel Animal Planet specials-JANE GOODALL'S RETURN TO GOMBE and JANE GOODALL'S STATE OF THE GREAT APE. View collected JOURNAL coverage of the environment. Selections include the father of sociobiology E.O. Wilson, the environmental risks of mountaintop mining and a photographic artist who makes pictures out of our trash. NATURE: "Jane Goodall's Wild Chimpanzees"
One of the world�s best known animal researchers surveys the results of more than three decades of painstaking study in PBS' NATURE documentary on Jane Goodall's work in Gombe National Park. SCIENTIFIC AMERICAN FRONTIERS: "Chimps R Us"
Alan Alda interviews Jane Goodall for the PBS series. Videos of Dr. Goodall's work and interviews with other chimp experts are available online. The Institute is a global nonprofit that "empowers people to make a difference for all living things." Projects include: Improving global understanding and the treatment of great apes through research, public education and advocacy; contributing to the preservation of great apes and their habitats by combining conservation with education and promotion of sustainable livelihoods in local communities and creating a worldwide network of young conservationists. The site also contains a wealth of information about the Gombe chimps. The Jane Goodall Institute's Center for Primate Studies at the University of Minnesota is a multi-media compendium of primate information for all levels of interest and scholarship. The Discovery Channel has an extensive multi-media site about Jane Goodall and her work. Included are videos about Jane Goodall's relationship with dogs, and family trees of several of the Gombe chimps. Find out more about the foundation's research into human origins and its founding family. Visit the official site of the home of Jane Goodall's studies. 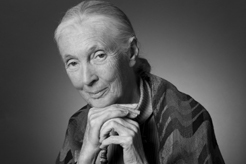 The Society's hub page for Jane Goodall materials. A global environmental and humanitarian youth program of The Jane Goodall Institute. Checking in on the welfare of threatened and endangered species. Simple things you can do to made a difference for the environment. Plus, a collection of reports on the environment.